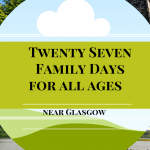 Summer is nearly here, or in Scotland as the kids are now off school it is already here….and I wanted to ensure it’s the best one yet for us. I have a thought to put together a “Bucket List” type thing, but more of a “Let’s make it a good one” so that we can look back and see how much fun and achievements we had along the way. I love to set myself goals and also to set our family a check list of fun things to try, new things to do, places to go – all together. It works a treat, as our weekends are never dull and very rarely do we have lots of free time bored. So here it is, and I look forward to blogging about each one of these along the weeks, and really it’s not a lot of time to do them so we need to get planning. So excited! I want to pass my CBT (Compulsory Basic Training) Test for riding motorbikes. Both Hubbie and me to complete a 5km race and improve our fitness over the coming weeks in preparation. Signed up today no less for JogScotland 5km race in Glasgow on Sunday 3rd August. Let’s see if I can beat my time of 36 mins from May 2014 and Race for Life, Glasgow. Another pre-booked up experience, where we have decided to go away for the weekend and stay in a Wigwam. Never done this before, but it seems like great fun getting into the open air. We are considering getting a tent to go on weekend holidays as a family, and think this will be a great introduction. Now all these things may require some luck with the weather for us, but fingers crossed we can do it. 8 challenges in 6 odd weeks shouldn’t really be a problem for us, and I can’t wait to have some fun doing them. Hello 2015…we have been expecting you!